A look at the work of a Foreign Service Messenger (QUEENS MESSENGER) as he makes a trip to Vienna. 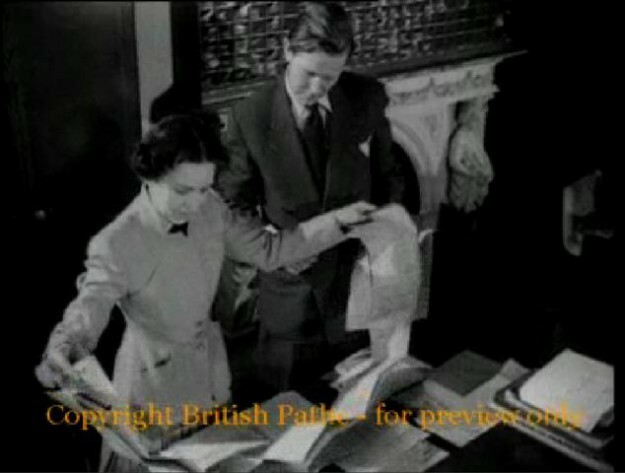 Found this newsreel film during some research which gives a great impression of the work of a QUEENS MESSENGER. Listen and watch carefully and you will learn a lot about reality & myth. Oh, and have you seen how huge (long) his passport is? Amazing! London, England and Vienna, Austria. C/U Silver Greyhound Medal of Queen’s Foreign Service Messengers. M/S’s people working in Foreign Office. M/S as clerk takes package from confidential files. Various shots of the files for different countries. M/S as car stops and messenger alights and enters. M/S messenger walking through office. M/S as he arrives at desk and a woman hands him a pen and a paper. Various shots as she opens his giant size passport. C/U as messenger talks to woman, she gives him his passport back and he walks off. M/S as he checks destination of bags and a man takes them away. Various shots as the man dumps the bags on the chute. M/S as messenger arrives at car as bags are taken from chute and thrown into the back. M/S as he gets in and it drives away. M/S of London Airport, camera pans to its sign. M/S’s of Foreign Office car sweeping past and into airport. M/S as messenger hails man with trolley. C/U Foreign Office badge on car. C/U as the messenger watches bags being taken from his car. C/U as messenger and bags enter Continental Departure Office. M/S as he hands papers to airport officer and helps to put bags on table. C/U customs officer. M/S bags and cases returned to trolley and messenger leaving office with them. M/S as they are put on the aeroplane. C/U hostess watching. M/S passengers boarding plane. Interior M/S of plane in flight. M/S of messenger and bags installed on seat. C/U pan from bags to messenger. M/S woman passenger sat opposite. C/U messenger reading. The air hostess serves him with tea which he drinks whilst looking out of the window. L/S aerial view of ground below. C/U engine cowling from window. C/U pilot of aircraft. L/S aerial view. Various shots as traps open and wheels drop down. C/U pilot. M/S plane taxiing at Zürich airport. C/U hostess. M/S as passengers disembark. M/S of messenger left on plane. M/S man next to plane. Interior shot of messenger, he reads his book and looks out of the window. M/S of passengers getting on again. M/S crew member. C/U wheels retracting as plane takes off again. C/U messenger looking out of window. M/S as plane comes in to land. M/S Vienna airport and plane. C/U sign for the R.A.F. station. M/S as passengers get off. M/S as security guard takes bags from messenger before he gets out. M/S as he gets in a car which sets off. M/S of barrier, car passes through to Russian occupied territory. It turns the corner and pulls up at Embassy. The chauffeur opens the door and the guard takes the bags, the messenger gets out afterwards. Various shots as they enter the Embassy to deliver the bags. Various good L/S’s of Vienna. M/S as messenger walks up steps and looks out at city. M/S rooftop cafe, he sits down. L/S Vienna. Finally you can see the video by clicking the image. Previous Previous post: Want to buy a really expensive passport?